Glenn Murray and Anthony Knockaert handed Brighton a crucial three points at Selhurst Park as the Seagulls did the double over their rivals for the first time in 35 years. Luka Milivojevic was on target from the spot for his side but it proved only a consolation as Crystal Palace lost 2-1. The two sides may not be that close geographically but this is a game that has grown into a fierce rivalry over the years. Dubbed the M23 Derby, recent history had been dominated by Crystal Palace who had moved to a level beyond Brighton. The Seagulls had emerged triumphant in just three of the last 15 meetings between the two sides prior to this season, dating back to 1989. You'd have to go back another five years to the 1983/84 season for the last time Brighton took all the bragging rights by doing the league double over their rivals. Such has been the rise of the south coast club in recent seasons though that they are once again on par with Crystal Palace in the top flight. And after an impressive 3-1 victory at the Amex Arena in the Premier League earlier this season, they were targeting an unlikely double in the early kick-off. It was a rough, physical contest with Brighton taking the lead through Murray's excellent volley after James Tomkins failed to clear a swooping long ball. Brighton had a clear penalty shout turned down when Shane Duffy was flung to the ground but Craig Pawson waved away the appeal. Crystal Palace had a wishful claim of their own waved away before Andros Townsend bought his side a way back into the game, drawing the foul from Davy Propper. Milivojevic levelled from the spot but a solo effort from Knockaert meant Brighton took the spoils. 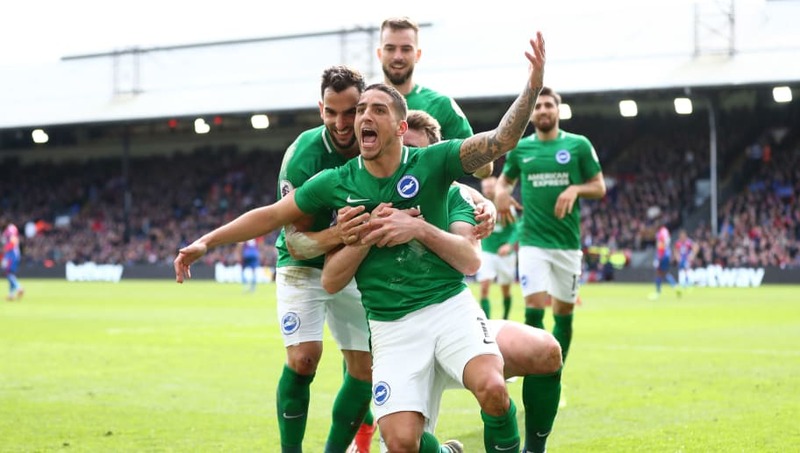 The result also had a significant impact on the league table with Brighton drawing level on points with their rivals in the relegation scrap. Both sides look in a strong enough position to avoid the drop but both still have work to do to guarantee Premier League football next season.